We are a team of marketing, creative, and business development specialists that help businesses produce better, more relevant marketing strategies and tactics. From identity development, to simple marcom strategies, to the creation and implementation of complete marketing plans, we’ll help you execute the strategies that will build brand awareness, increase visibility, manage leads, acquire customers, and sell products. See how we give back to our community. I love everything about the launch! Great job to all working it. The ideal online customer journey begins with a user-friendly website that combines seamless navigation, a clean-cut path to digestible content, and mobile compatibility. 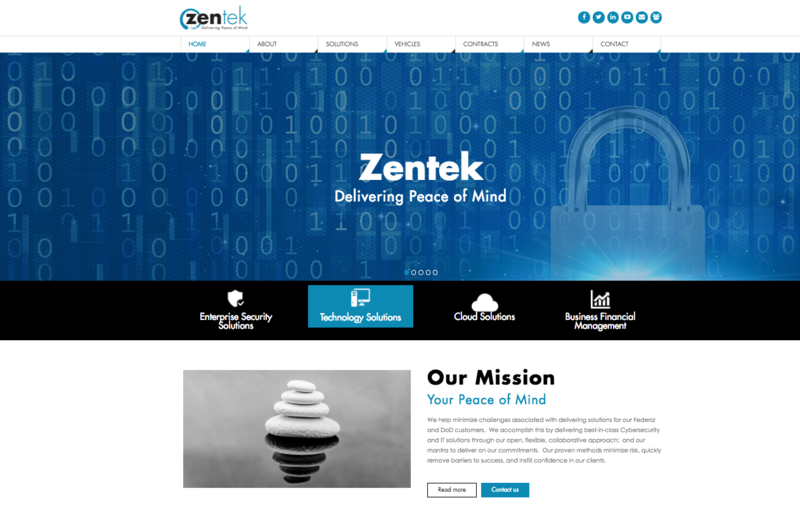 Zentek’s mission is to deliver peace of mind for their clients, our mission was to deliver peace of mind through their website design and development journey… we delivered. We are a team of bright, innovative and talented veteran marketers dedicated to big ideas, fresh insights and measurable results. Our unique blend of technical, creative, business, and project management expertise enable us to build programs that deliver tangible results for our clients. We pride ourselves on taking challenging marketing issues and turning them into opportunities for our clients, on pointing brands in the right direction, and on getting our customers noticed both online and off.